As the quest for the World’s finest bowl of ramen continues, we find ourselves again, parked outside a small storefront in a strip mall in the suburbs of a metropolitan city. 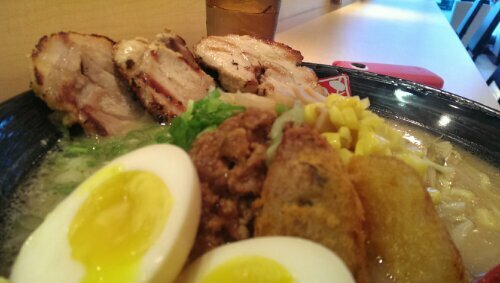 This time we are to sample what is regarded in all corners of the globe, as one of the best ramen you can find. And now, it’s available here, not in the bustling streets of the Gold Coast or Lincoln Park, but instead, in a tiny set back shop, extremely easy to miss, twenty miles outside of the city – in Morton Grove at Misoya Ramen (1584 S. Busse Rd.). We arrived at 4:40 PM. The restaurant opened at 5. We were early by chance, not at all intentional, yet when we noticed another half dozen cars waiting in the lot for the doors to open, we realized we may have lucked out. What seemed like an hour passed as we waited anxiously for our chance to sample some of the best ramen according to the masses. Finally, it was 5 o’clock PM. The host welcomed us along with the other twenty or so guests waiting patiently and we were seated at the bar. The space was minimal. Bamboo toned wood adorned the walls and made up the bar as well. We felt as though we were ushered away to an authentic noodle house in Japan. We quickly glanced at the menu and discovered they were known for their Miso Ramen. 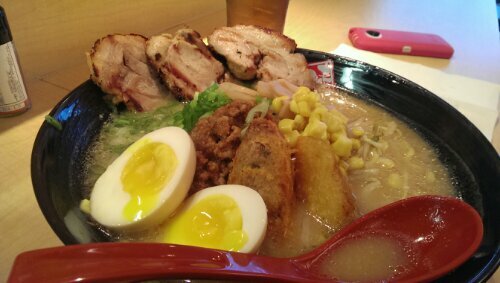 In fact, other than maybe six or so other items, all they serve is Ramen. 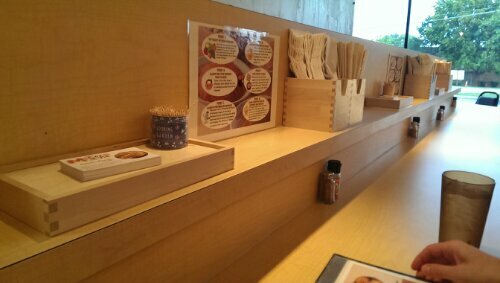 They had tidbits displayed all around the restaurant touting the benefits of Miso in ones diet. 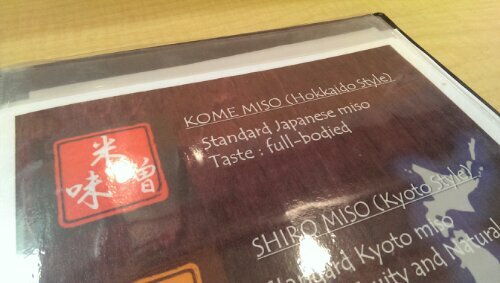 They offered different style of Miso broth – one “traditional,” one slightly more bitter, and one a bit sweet. We opted for the traditional variation and also ordered the special Ramen that day – Tonkotsu, a pork broth style that Jill and I have discovered is our favorite. The ingredients in the two Ramen were pretty much identical, but the broths couldn’t have been more unique. The miso was slightly lighter in body and displayed an herbaceous, umami quality that was absolutely delicious. It wasn’t too overpowering for the light vegetables and pork that accompany the broth, but it was rich and layered in flavor. Really nice. 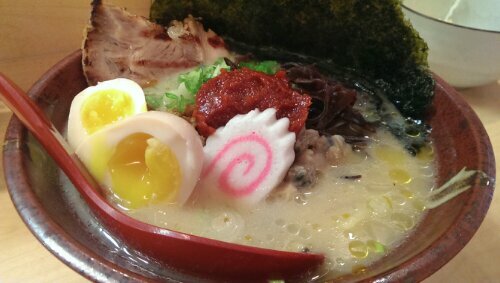 The tonkotsu didn’t disappoint in the least. It too was rich in flavor, though more full bodied, it was still light and bright with fresh, handmade noodles, slow cooked pork belly, and a melange of perfectly cooked vegetables. 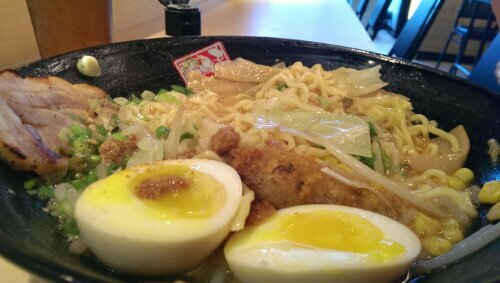 The noodles were tender and held onto the broth well. The layering of flavor they achieved can only come from a 14-18 hour process by which the broth is crafted. Driving long distances for Ramen has paid off more than once in our case. If folks are willing to drive hours for great fried chicken, barbecue or a burger, then why not a mere twenty or thirty minutes for some of the most delicious “soup and noodles” you will ever slurp. ← #141 – Real Urban Barbecue. Yes, BBQ can ACTUALLY be healthy!